Official investigations in both Britain and France found that Diana died in a manner consistent with media reports following the fatal car crash in Paris on 31 August 1997. However, it was theorized that there was an orchestrated criminal conspiracy surrounding the death of Diana, Princess of Wales. The absence of CCTV images showing the Mercedes’s journey from the hotel to the crash site has been frequently cited as evidence of an organised conspiracy. There were more than 14 CCTV cameras in the Pont d’Alma underpass, yet none have recorded footage of the fatal collision. Sources have claimed that they were turned to face the wall, or were simply switched off. The official French judicial inquiry into the crash was told that none of the cameras were working. However, one motorist received a speeding ticket after being caught on a nearby camera 15 minutes before the accident. A handwritten letter in which Diana, Princess of Wales claimed that the Prince of Wales was plotting to kill her so he could marry Tiggy Legge-Bourke, the former nanny to Princes William and Harry, has been shown at the inquest into her death. The note was sent to Paul Burrell, the princess’s then butler, in October 1993, 10 months after her separation from Prince Charles was announced. 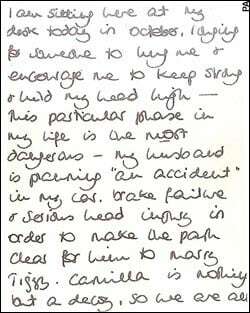 Part of it read: “my husband is planning an ‘accident’ in my car, brake failure and serious head injury, to make the path clear for him to marry.” The letter has been shown at the inquest at the Royal Courts of Justice in London to witnesses who have been challenged over their assertions that the princess did not fear for her safety. There was some media discussion in April 2006 suggesting that Diana was a faithful seat belt user and therefore the fact that both her and Dodi’s seat belts either failed or were not used was sinister and might suggest sabotage. Analysis of the wreckage of the car after its repatriation to England in 2005 by a Forensic Accident Investigator from the Transport Research Laboratory of thirty-five years experience on behalf of Operation Paget found that all the seat belts were in good working order except for the right rear one which was attached to the seat Diana occupied. The British inquest verdict explicitly stated that lack of seat belts had “caused or contributed to” the deaths of both Dodi and Diana. Analysis of the wreckage of the Mercedes revealed it had glancing contact with a white Fiat Uno car which left traces of paint on the Mercedes bodywork. Extensive attempts by the French police to find the vehicle involved were unsuccessful. This French photographer, who had been following Diana and Dodi all Summer, was known to have owned a white Fiat Uno, which was sold and resprayed days after the crash. He was also a paid informant for both British and French intelligence, but insisted that he was not in Paris on the night of the accident. Three years later, his charred remains were found in a locked car in remote farmland in the South of France. Local authorities said it was suicide; conspiracy theorists say it was murder. 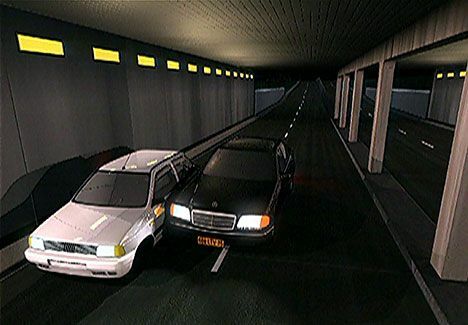 An alternative explanation for the cause of the crash has been reports of a bright white flash just before the car entered the tunnel, blinding the driver. It was found by the authorities that three eyewitnesses at the scene of the crash claimed to see a bright flash of light before the accident. Former Mi5 agent Annie Machon claimed Brtitish intelligence paid to have Diana killed by shining a bright light at the car after it entered the tunnel, to prevent Paul seeing. 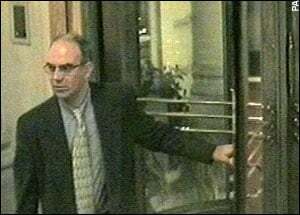 A post-mortem examination on Henri Paul suggested that he was drunk: tests revealed 1.74 mililitres of alcohol per milimetre of blood, more than three times the French drink-drive limit. However, the Fayed camp maintains that blood samples taken from his body were swapped with those of someone else to cover up a murder plot. On 9 December 2009, it was reported that DNA samples confirm the blood samples with high alcohol levels were indeed from the driver. This was established by a comparison with samples provided by Paul’s parents. The first call to the emergency services’ switchboard was logged at 12.26 a.m. The SAMU ambulance carrying the Princess arrived at the Pitié-Salpêtrière Hospital at 2.06 a.m. This length of time has prompted much conspiracy-related comment. Some experts have suggested that the Princess might have been saved if she had been operated on more rapidly. Diana was removed from the car at 1:00 a.m. She then went into cardiac arrest. Following external cardiopulmonary resuscitation, her heart started beating again. She was moved to the SAMU ambulance at 1:18 a.m. The ambulance departed the crash scene at 1:41 a.m. and arrived at the hospital at 2:06 a.m.—a journey time of approximately 26 minutes. This included a stop at the Gare d’Austerlitz ordered by Dr Martino because of the drop in the blood pressure of the Princess of Wales and the necessity to deal with it. The ambulance was travelling slowly on his express instructions. The doctor was concerned about Diana’s blood pressure and the effects on her medical condition of deceleration and acceleration. The hero firefighter who gave Princess Diana CPR as she lay dying after the tragic car crash believed he had saved her life. Xavier Gourmelon says there “was no blood” on her at all, and he didn’t believe she was seriously injured when he first arrived at the scene. He claims he had no idea he was treating a royal, saying he worked as if it was “any other” incident. Mr Gourmelon, who worked as firefighter for 22 years, comforted Diana and tried to reassure her. He claims Diana then asked him what has happened. He gave her some oxygen and his team stayed with her when she was taken out of the car. But when she was out she suffered a cardiac arrest as she lay on a stretcher. Mohamed Al-Fayed alleged that Diana’s body was deliberately embalmed shortly after her death to ensure that any pregnancy test at the post-mortem would produce a false result. Under French law, paperwork must be completed before undertaking the embalming of any corpse likely to be subject to a post-mortem. This paperwork was completed, but only after the embalming had been carried out, giving rise to allegations of suspicious circumstances. Nine photographers who had been following Diana and Dodi in 1997, were charged with manslaughter in France. France’s “highest court” dropped the charges in 2002 Three photographers who took pictures of the aftermath of the crash on 31 August 1997 had their photographs confiscated and were tried for invasion of privacy for taking pictures through the open door of the crashed car. The photographers, who were part of the “paparazzi” were acquitted in 2003.